Was supposed to post up these pictures but I sort of forgot about them! Oh how could I! 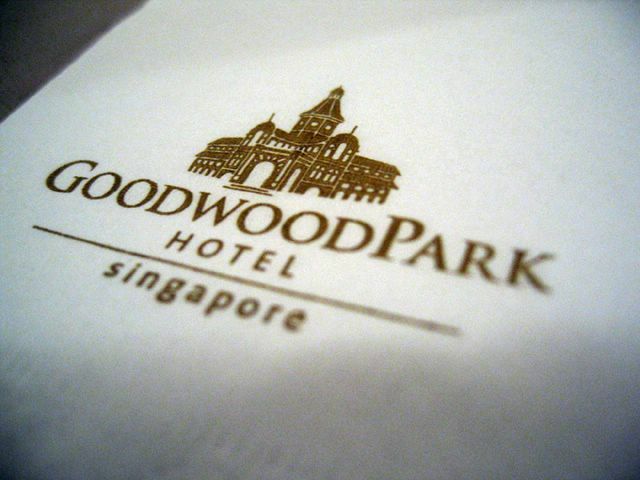 Goodwood Park is famous for their durian pastries and I’ve tried their durian mooncakes before thanks to my aunt but this was the first time I’ve tried their cream puffs. 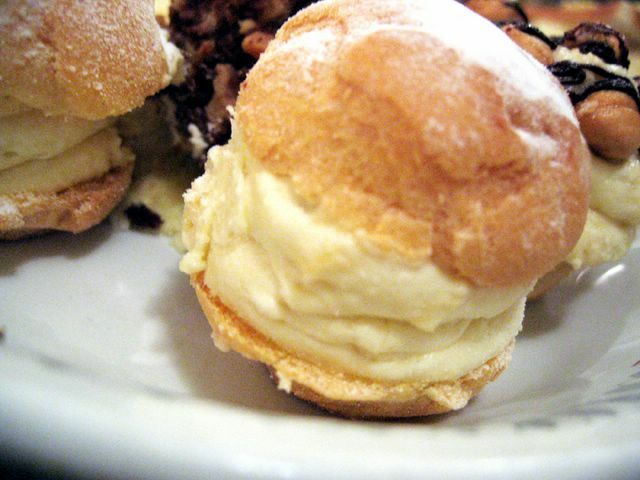 These cream puffs were amazing – wait till you see the rest…. 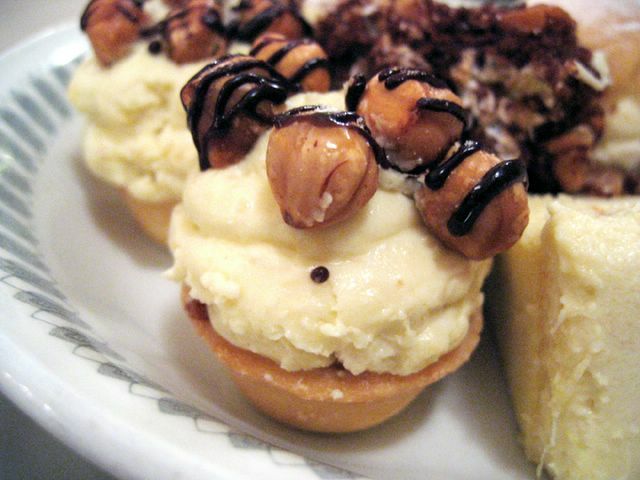 That’s the durian crunchy hazelnut tartlet. One of my favourites. I’m really impressed by how many durian creations the chefs are able to come up with. Like, seriously! Durian waffle. Mmm…. 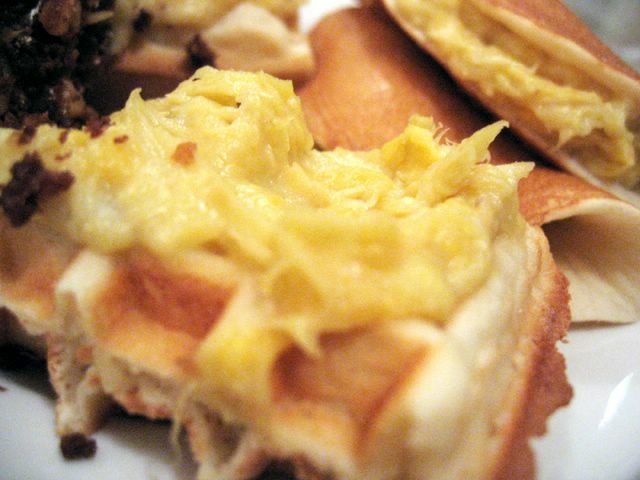 okay, it’s pure durian paste spread on waffles. Check out the pancakes stuffed with the same durian paste. Now now, who said you can’t eat durian with anything? You can have them on toast too if you like! It brings a whole new dimension to toast. 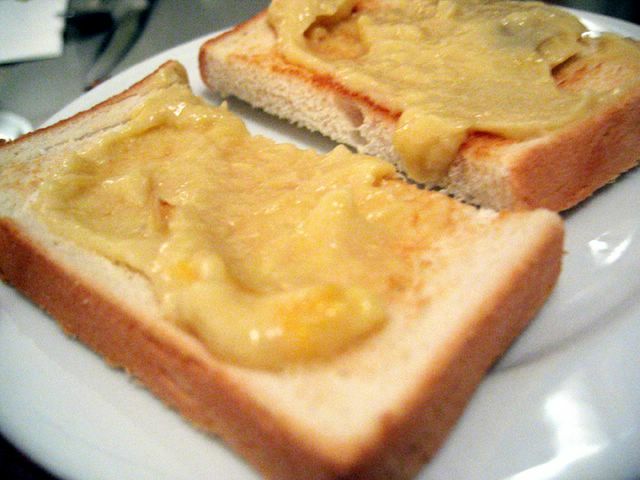 I wish coffeeshops sold durian toast instead of kaya toast. Haha, ya i sound rather insane. Perhaps I am. I love durians! Love the taste, the texture; I dig how the creamy flesh slides down my throat and versatile it is. It is truly the king of all fruits. Check this Durian & Espresso Bar. 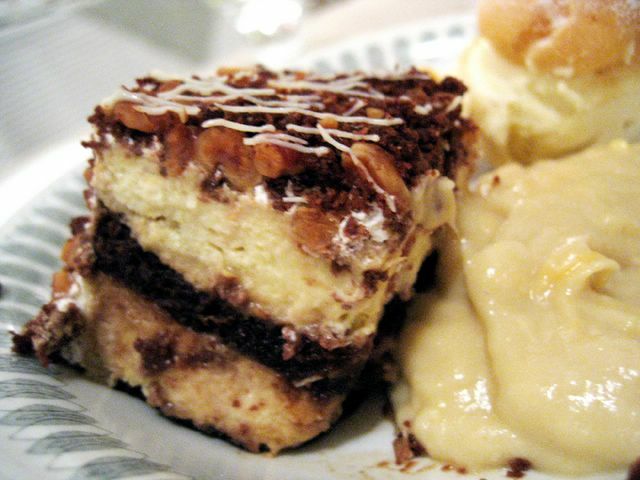 It’s like a durian version of the tiramisu. Yummmy. I couldn’t stop eating these. Can you see the durian pudding beside it? Pure, unadulterated D24 durian – it rocks my world. 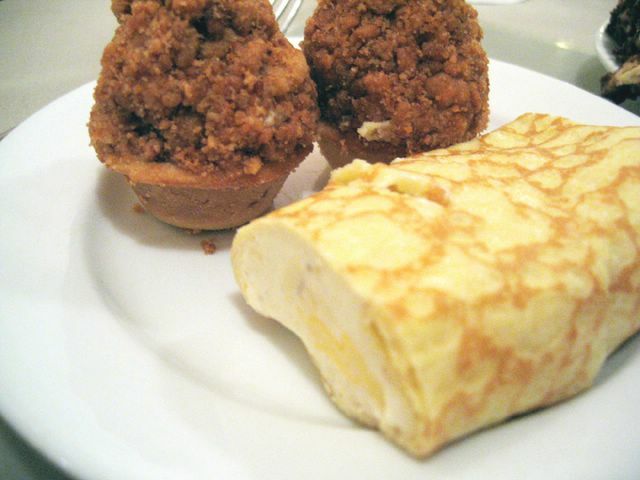 Here’s some Durian crumble and Durian crepe. Both were delicious. Okay, I think you’ll all be thinking that I’ve gone mad and died in my fantasy durian haven. Actually, I felt like puking after the buffet. It was seriously a durian over dose. You see why I don’t like buffets much? There’s a tendency to eat more than you can take. Haha. Or maybe I was just being a bit too greedy. Okay okay, I don’t do this often so ya, I should feel less guilty. Anyway durians are dense stuff and eating too much of it will make you want to hurl – I won’t deny that. But you see, I adore this fruit. It’s special and though alot of people (esp those who aren’t from Asia) would run away from it, I’ll simply run to it. Anyway this durian buffet is seasonal and this one ended in August. I’m glad I went before it ended. I seriously adore durians, but I have to agree that a buffet with a major number of durian desserts is a tad much! The durian-hazelnut tarts and the durian-tinged tiramisu clone sound very interesting, though. It’s my first visit to your blog and I really love it! darn i missed it 🙁 when did this buffet start? I used to work in the cold kitchen in GWP and piped those durian fillings into the puffs but still I never get tired of eating one after another after I piped. It was the most delicious puffs I ever eaten. Durians!!!! Gawd my number 1 LOVE!!!!! Thanx for sharing babe! Id definitely ask my friend to go with me since my bf hates durians to the core, hahaha… For now, need to lose some wt before i indulge.. hahaha eat too much good food la..
Melz: it was about $20+++ hmmm next season? i’m not too sure. next year maybe?